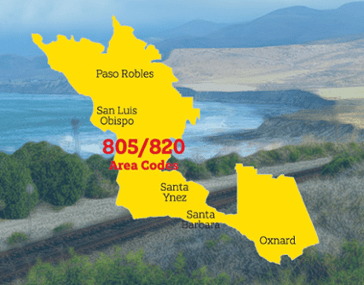 Did you know that a new 820 area code is coming to the 805 service area? Your existing phone numbers will not change, but starting in summer of 2018 new phone numbers that get issued in the existing 805 area may have the new 820 area code instead. So what does the new 820 area code mean for me? Starting December 1st, 2017 you should start dialing “1” plus the three-digit area code for all calls from telephone numbers with the 805 and 820 area codes. This becomes mandatory June 2, 2018. How can the 820 area code affect my business? You may have to reprogram phone equipment that is currently only dialing a seven-digit phone number to now include the “1” plus the three-digit area code. This could include automatic safety systems, medical monitoring devices, speed-dialing, call forwarding, voicemail services, call forwarding and other similar services. What should I do about the 820 area code? You should test your telephone equipment, for example your PBX or fax machine, to determine if it can dial and receive “1” plus the three-digit area code phone numbers. You might also want to update business collateral such as stationery, checks, business cards, advertisements, promotional items, brochures and catalogs to include the area code in the telephone number. Find out if your business phones need updating to conform with the new changes by contacting us.